The Value of Pearls | Demand for Natural Pearls at Auction | Skinner Inc. Important Natural Pearl Necklace, purchased by the consignor’s family in Paris, late 19th century. Sold for $2,211,ooo. As the style icon, Jacqueline Bouvier Kennedy Onassis once said, “Pearls are always appropriate.” Cultured pearls, the most common on the market are grown by oyster farmers using a mother-of-pearl seed. The process was first patented by Mikimoto in 1916, and since then the pearl market has been dominated by cultured pearls. While beautiful, their value on the secondary market is usually quite low in sizes under 10mm. On the other hand, natural pearls are grown entirely without human intervention and currently bring exceptional prices at auction. Natural pearls are rare, especially in larger sizes. In December of 2015, we sold an extraordinary strand of natural pearls for over $2,000,000. This strand was remarkable not only for the size of the pearls, the largest was over 12mm, but also for the rose and green overtones which is sometimes poetically referred to as the “orient of pearls.” Necklaces of this size and quality are quite rare on the market. Smaller sizes of natural pearls also bring strong prices. A beautiful necklace of natural pearls with its original Art Deco diamond clasp sold for over $140,000 and a necklace of cream pearls, the largest at just over 8mm, sold for over $70,000. It is not only necklaces that are sought after by natural pearl collectors, but also single pearls set in earrings and brooches. 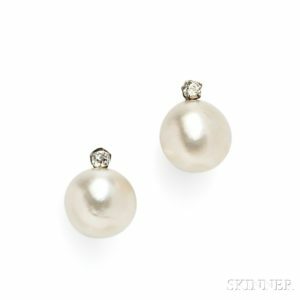 We sold an antique pair of natural pearl earrings, each set with a pearl slightly over 15mm, for $315,000. The exceptional size and color drove extremely competitive bidding and it was an added bonus that we were able to trace their ownership to the mid-nineteenth century. These auction results for pearls are inspiring people to take their pearls out of their jewelry boxes – we’ve seen christening pearls, first communion pearls, and wedding pearls. Are they natural? The only way to find out for sure is to have them tested in a lab. Natural pearls also need to be examined for how well matched they are in size, color, and roundness. Your typical baby-sized strand of natural pearls could be valued as little as $300 or as high as $1,500. Editor’s Note: This post was originally published in March 2013 and has been completely revamped and updated for accuracy and comprehensiveness. This entry was posted in Blog and tagged buy pearls, fine jewelry, Gloria Lieberman, jewelry auction, natural pearl necklace, natural pearls, pearl jewelry, pearl strand, pearls auction, sell pearls, value of pearls by Kaitlin Shinnick. Bookmark the permalink. Emailed Asian Art Dept. pictures of large silk/fine thread art/tapestry as well. Thank you for your interest in Skinner and for sending pictures of the tapestry. Please submit photos of the pearls using our online auction evaluation form: secure.skinnerinc.com/appraisals/form.asp. You may also contact the jewelry department directly at jewelry@skinnerinc.com. My mother gave me her pearls and im trying to see what the value is on them very interested please. Heather, To find out what your pearls may be worth at auction, please submit photos and an auction evaluation form on our website: secure.skinnerinc.com/appraisals/form.asp. Thank you! Hi Christopher, Skinner’s Appraisal Department would be more than happy to assist you in finding out more about your pearls, please submit photos and an auction evaluation form via our website: https://www.skinnerinc.com/selling/auction-evaluation-form/ or contact the Appraisal Department directly at 508-970-3299 or appraisals@skinnerinc.com. Thank you! I have quite large natural antique pearls of more than 200 year old or so.Out of these pearls one pearl was weighing 10.88 cts. This was got tested from GIA america and the report was natural pearl. I hv got about 102 no.of such pearls weighing about 1089 carats in total.The luster etc. is quite good Shape is also good.If you want to see I can send you the photographs or you can depute someone to visit me in New Delhi,India.I want a genuine buyer who has real love for natural rarest pearls of this size pearls and that too in such nos.at one place.Please send me the value which I can fetch for each pearl. I have a vintage 3 stranded pearl akoya necklace. Passed down frome my great grandmother. It’s from early 1920s, rose colored princes length,ranging in sizes 2mm to 8mm…how much would it be worth? I have a childs pearl necklace that measure approx 17″ with 5 diamonds on the clasp. I can send you images if you are interested. I would like to sell it. Hello, I need some advice,, I have been diving of the Mozambique coast, and I found 5 pearls in some clams!! what is the value of these pearls? they are between 5-7 millimetres. I inherited a double strand of pearls (168 pearls 8.5mm on average) from my great aunt. It was given to her as a wedding gift in 1919. I do not have a receipt like you have shown above. I took the necklace for X-rays to see if there was a nucleus and they appear to be natural (without that nucleus line like cultured pearls). I know Mikimoto began experimenting with “culturing” pearls around that time with some success. These are stunning beautiful. The lustre is incredible. I would love to have these appraised and would like to ask if I should also consider sending them to the GIA for rating and grading. I inherited a delicate white pearl& white gold pendant on a 14Kt white gold chain from my mother-in-law. It was given to her when she was a young girl in the 1940’s. The clasp has cultured and 14K on it. I am curious what value that would have. The pearl pendant necklace that belonged to my mother-in-law when she was a young girl is from her first communion. I have one very rare BASARA pearl weighing 18.33 carats.My grand mother used to wear it.It is perfect round in shape.It has wonderfull luster and is perfect in all respects. I want to sell it. Please tell me the procedure and the expected price I can fetch. I was given an 18inch strand of pearls from my mother, after she passed. My two sisters also received pearls. I would like to know the value please. Thank you for your inquiry. Please use our auction evaluation form to send images for evaluation: https://www.skinnerinc.com/selling/sell-at-auction. It will be forwarded to Skinner’s jewelry specialist. I have a GIA certified strand of 80 natural pearls 4.00mm to 9.05mm with a emerald and diamond clasp from the 1930’s. I would like to know the approximate value. Thank you for your interest. I will forward your inquiry to our Jewelry specialist. In the meantime, please use our auction evaluation form to send images for evaluation: https://www.skinnerinc.com/selling/sell-at-auction. I have some graduated natural pearls that no longer have the original clasp. Will they sell better if I get a clasp put on – and should I take care to get a vintage clasp ( since they are antique) or would a new clasp do just as well? I have fresh water pearls that I have been told are more than 4,000. years old (Mound Indians) . Are they valuable only in the historical sense? Hi Sandy, Our Appraisals department would be happy to assist you in your questions. Please contact them at 508-970-3299 or appraisals@skinnerinc.com. Thank you! I have a vintage pink pearl choker each pearl approximately 11 mm’s with a diamond clasp, perhaps 1/4 carat of diamonds, with matching earrings 11 mm pink pearl with 1/4 diamond each earring. These were purchased in Paris during WW II. How do I begin the process to perhaps sell these at auction? Hi Joan, Skinner’s Appraisal Department would be more than happy to assist you in finding out more about your jewelry. Please submit photos and an auction evaluation form via our website: https://www.skinnerinc.com/selling/auction-evaluation-form/ or contact the Appraisal Department directly at 508-970-3299 or appraisals@skinnerinc.com. Thank you! I have a Japenese Akoya pearl necklace that i would like to sell. 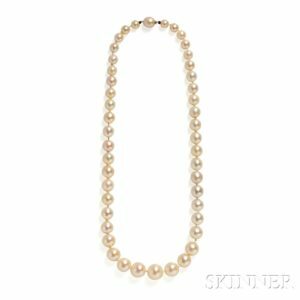 Skinner’s Appraisal Department would be more than happy to assist you in potentially selling your Akoya pearl necklace at auction. Please submit photos and an auction evaluation form via our website: https://www.skinnerinc.com/selling/auction-evaluation-form/ or contact the Appraisal Department directly at 508-970-3299 or appraisals@skinnerinc.com. Thank you! I have a couple of pearls and I’d like to know how much its value. Hi Jack, Our appraisals department would be happy to assist you in finding out more about your pearls. Please submit photos and an auction evaluation form via our website: https://www.skinnerinc.com/selling/auction-evaluation-form/ or contact the Appraisal Department directly at 508-970-3299 or appraisals@skinnerinc.com. Thank you! I would like to speak with someone about a strand of pearls which I own, and may wish to sell. They have a Boucheron sapphire & diamond cstch. The strand contains 77 pearls graduated from 5 to 9 mm. I have a ring with a pearl in the setting. my father was cutting buttons from shells for a living and found this pearl in a shell. i’m 86 yrs of age and my mother passed at 84. I was about 7 when he found it. approximately how much would it appraise at? Hello Jay, Thanks for the comment. We are always accepting consignment requests for Jewelry – to find out what your pearls may be worth at auction, please submit photos and an auction evaluation form on our website: secure.skinnerinc.com/appraisals/form.asp. Several years ago I got a very interesting mis-shaped pearl cluster from a natural oyster. I looks like three pearls fused together. it is large and I have been told that this typy of phenomanon may have some value. Also, i received another mis-shaped pearl from anothe natural oyster that appears mostly flat. I would like to know the value, as I been offered a large amount for them. I have no idea. Please help if possible Thank you. Hi Jack, Our appraisals department would be happy to assist you in finding out more about your pearl. Please submit photos and an auction evaluation form via our website: https://www.skinnerinc.com/selling/auction-evaluation-form/ or contact the Appraisal Department directly at 508-970-3299 or appraisals@skinnerinc.com. Thank you!